Advanced Spyware Remover produces ridiculous false positives. We have tested the program on absolutely clean uninfected computer and it managed to find 18 system services and 3 Internet Explorer add-ons classified as the infection. 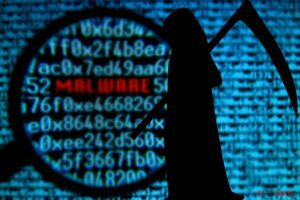 The analysis showed that detected system services actually are fully legitimate harmless components of Windows OS and installed important software. For instance, dmadmin is Logical Disk Manager Administrative Service, the standard part of Microsoft Windows XP. OracleMTSRecoveryService, OracleOraHome92Agent as well as other similarly named services belong to well-known Oracle database software. VMAuthdService, VMnetDHCP and VMWare NAT Service are essential components of popular VMWare virtual machine. Other services such as kavsvc, LexBceS, NVSvc or vsmon are related to other legitimate applications like Kaspersky Anti-Virus, ZoneAlaram firewall, Lexmark and NVIDIA device drivers. See a screenshot provided below. A system scan performed on our test computer containing hundreds of gigabytes of files did not take more than few seconds. 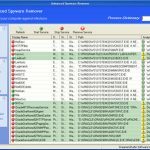 We are absolutely sure that Advanced Spyware Remover does not scan the Windows registry, running processes, file system or any other objects at all. The application includes several additional security and monitoring tools. However, some of them do not seem to be very useful. For instance, the System Services utility describes legitimate essential services as “distrustful” files. 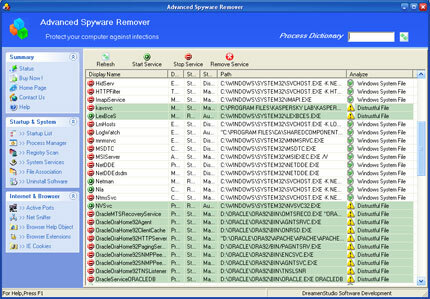 Advanced Spyware Remover claims that services related to Kaspersky Anti-Virus, Oracle database software, VMWare virtual machine, ZoneAlarm firewall, Lexmark printer and NVIDIA graphics card drivers as well as harmless StyleXP progam designed to modify Windows visual appearance are suspicious and therefore should not be allowed to run. 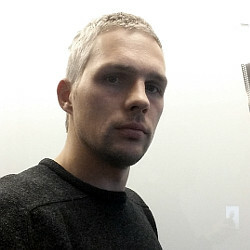 See another screenshot. 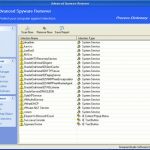 Free version of Advanced Spyware Remover refuses to remove any objects it finds and asks to register and purchase full product. Some functions are also disabled. The program’s official web site is www.dreamenstudio.com. 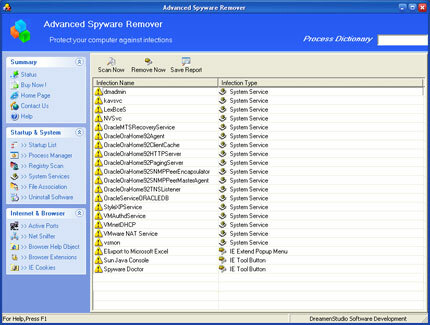 Advanced Spyware Remover deceives the user and cannot protect your privacy and security. Following its instructions would corrupt installed software and damage the entire system, but not eliminate spyware parasites. We DO NOT recommend purchasing and using this program. This entry was posted on 2012-03-19 at 09:35 and is filed under Corrupt Anti-Spyware, Software.